One of my favorite restaurants of all time is Michael Mina in the Bellagio. Scott and I got married in Las Vegas and each year for our first few anniversaries, we’d go to Vegas to celebrate. A meal at Michael Mina is a must-do if you’re in Vegas. It’s fancy, it’s fabulous, and they have phenomenal food, including amazing Chilean sea bass. I wanted to recreate something a little bit fancy at home because weekend trips to the Bellagio with a five year old in tow aren’t happening any decade time soon. You know the old expression, champagne taste, beer budget? Champagne taste, champagne vinegar budget is fits, too. I tossed oranges, cucumbers, dill, and ground mustard with agave and champagne vinegar and this little relish turned out so well that I plan to make it during warmer weather as a side salad or a topping for just about anything from tofu to grilled portobellos. Champagne vinegar is about $10 dollars for a bottle and that last you many, many recipes. Or you could make this relish with rice wine vinegar or apple cider vinegar. The sea bass was perfect. Was it Michael Mina at home? I don’t want to give myself that much credit but Scott said it was the best at-home fish I’ve ever made. I’ll take it. And I’ll take a trip to the Bellagio, too, thanks honey, love ya. I can dream. In a small bowl, combine all ingredients except cucumber and orange, stir to combine. 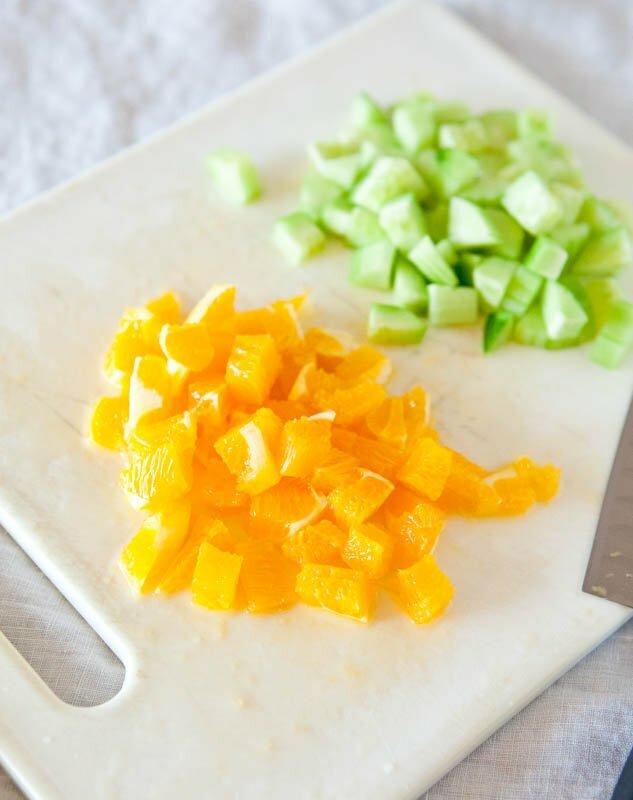 Add the sliced cumber and orange to the bowl, stir and toss to coat. Set aside. You can make this ahead of time, up to 24 hours in advance, cover with plastic wrap and refrigerate. The longer the relish sits, the more the cucumber and orange will release juices, but the more the flavors will marry. 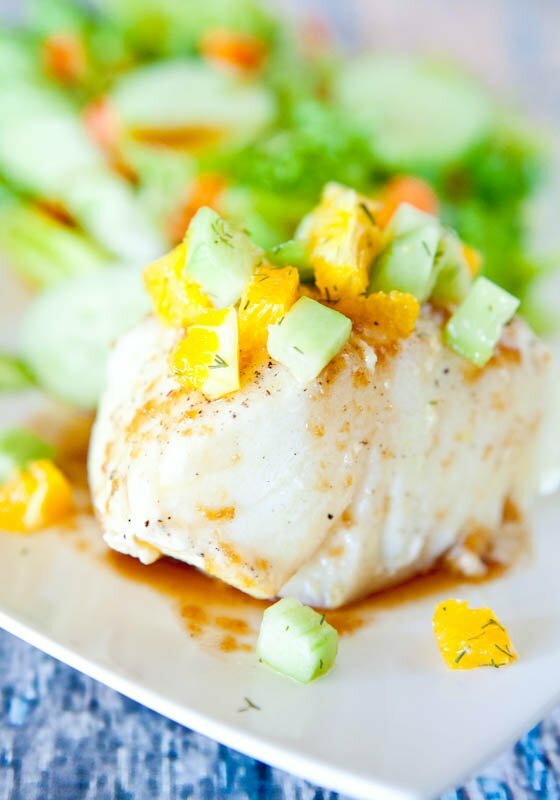 Spray a large, non-stick skillet with cooking spray, place the fish in it, squeeze the juice of half an orange evenly over the top of the fish, drizzle evenly with the olive oil, and sprinkle with salt and pepper. 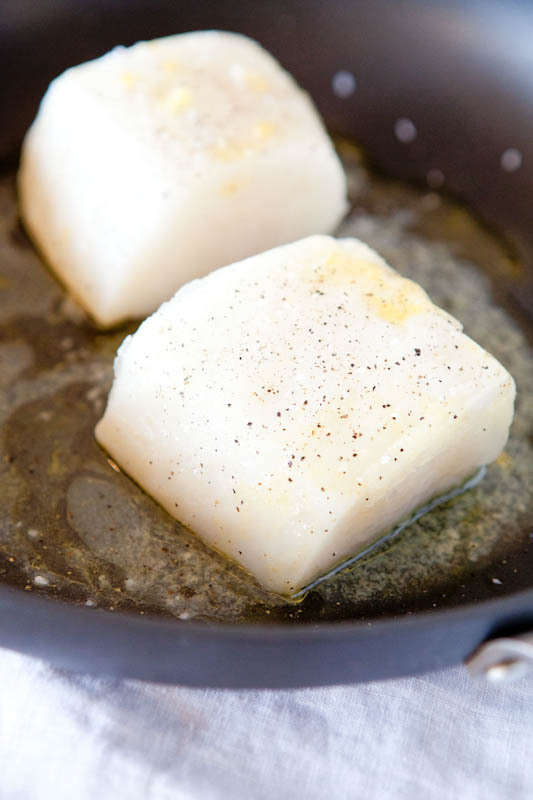 Cover the skillet and cook fish over medium-high heat for approximately 6 minutes on the first side, flip and cook (covered) for 2-3 more minutes, adding more oil as needed. Since all pieces and cuts of fish differ, cooking times will vary. Fish is done when it’s opaque and white. Due to carry over cooking, the fish will continue to cook even after removed from the heat source; take care not to overcook while it’s still in the pan, as it will become tough and rubbery as it cools and when served. Allow fish to rest for a couple minutes, plate it, spoon relish over the top or on the side, drizzle with fish sauce if desired, and serve. 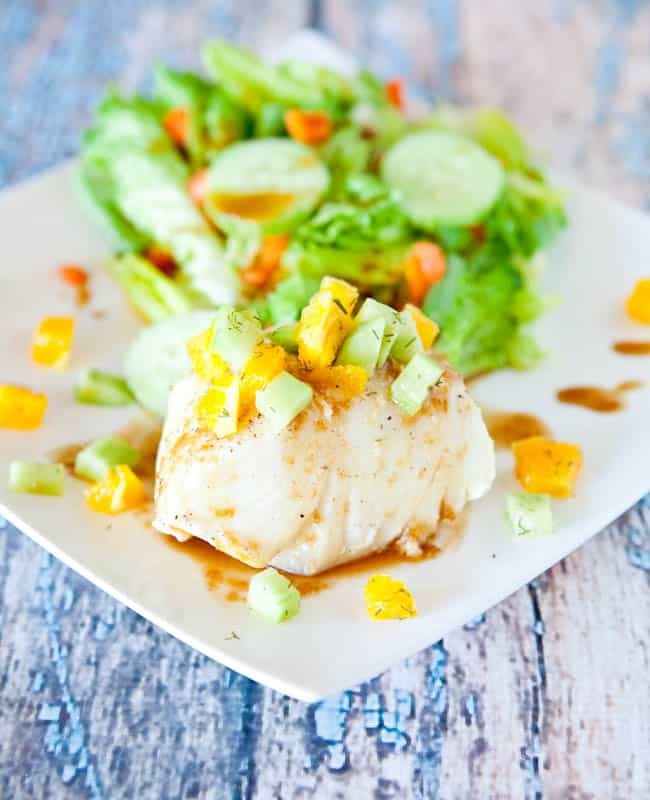 Note: If you can’t find Chilean sea bass or want to substitute a less expensive or easier to find fish, I suggest Mahi Mahi, red snapper, tuna steaks, tilapia, cod, or whatever looks good in the fish case. Or, try unbreaded frozen fish filets, which will likely be cheaper than fresh, and which can be prepared using this recipe after they’ve thawed. If you’ve never had sea bass, it tastes like chicken because everything tastes like chicken, right? Okay, no, it does not taste like chicken. It has an ever-so-slightly sweet undertone and it’s not “fishy”. 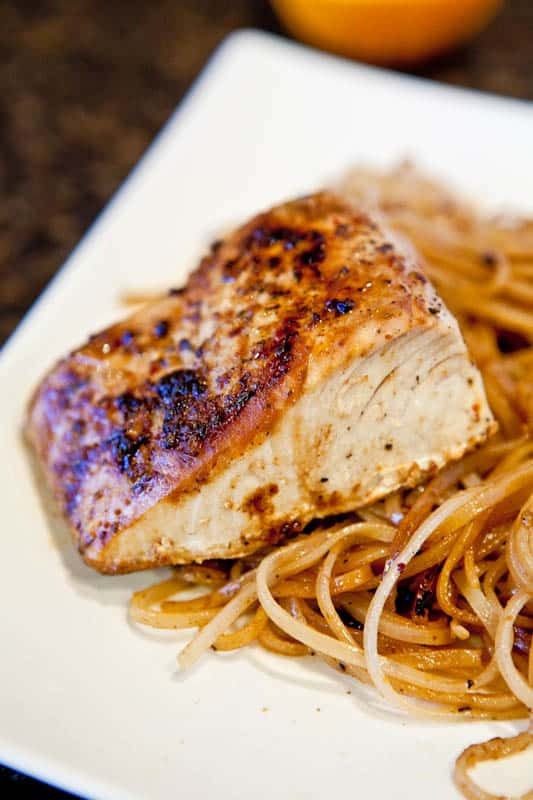 It’s not a particularly strong-flavored fish like salmon or tuna can sometimes be with their very distinctive flavor. Rather, it’s neutral but in a perfectly understated way. 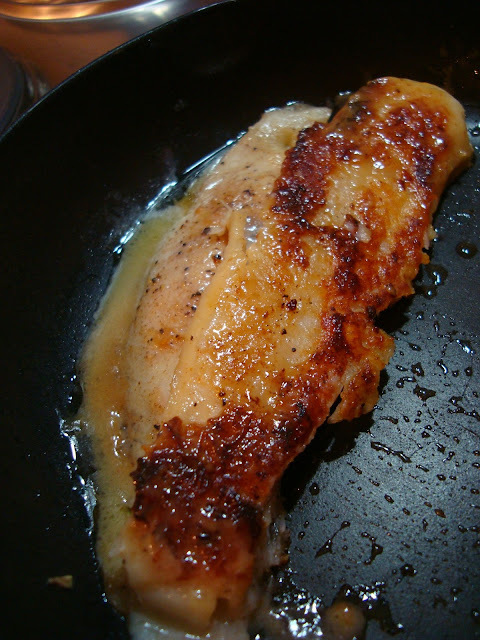 It’s also a fairly firm and hearty fish and not flaky or too delicate and stands up very well to pan searing. 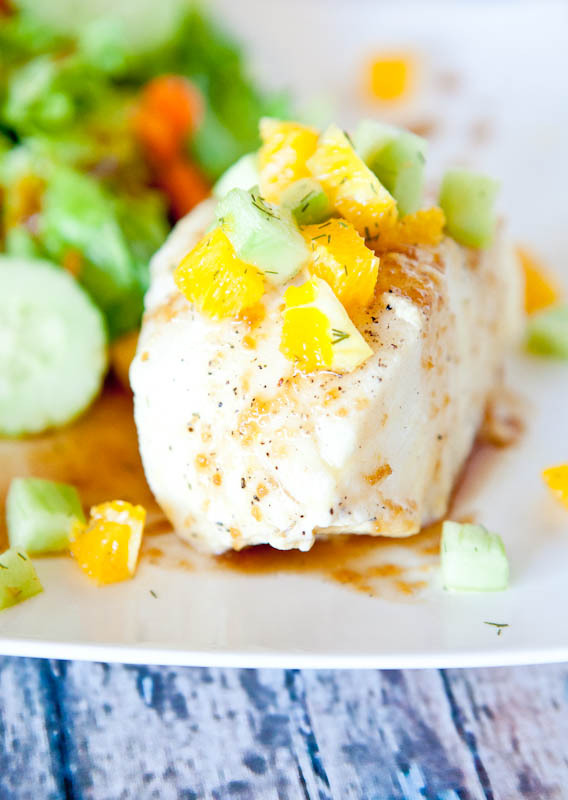 I simply drizzled olive oil and the juice of half an orange over the fish, seasoned with Kosher salt and freshly ground black pepper, and cooked over medium high heat, flipping once. While the fish is cooking, you can make the relish, or if you plan ahead, making the relish up to 24 hours in advance is not only okay, it’s preferred because the flavors have time to marry. After the fish was done cooking, I drizzled some fish sauce over the top, added the relish and a side salad, and dinner at Michael Mina’s at my house on a Monday night was served. This was a splurgey dinner, but I think it’s important every now and then to keep dinners from feeling humdrum and this sure beats frozen corn dogs on a stick. Plus, meals like these are reminders of fun times and delicious meals Scott and I used to eat out at fancy restaurants. The family could have torn through another $50 dollars worth of sea bass if I had it, but I didn’t. So we moved onto dessert. How often do you cook “fancier” food versus more “average” fare? Life can be one series of busy weeks. It starts Monday, it ends Friday, it’s rush-rush-rush, blur-hurryup-fast-paced in between. Sometimes it’s not only nice, it’s necessary to put down the frozen pizza box and venture into fancier territory. And then when I’m done being fancy, making strawberry cake in a mug in the microwave is great. Everything has its place. I need this to slide down my throat, rah naw. Wow! What a gorgeous, colorful and healthy dish! This will definitely be making an appearance on my plate soon. Fabulous recipe, Averie! Thanks, Georgia, and keep me posted if you do make it! Where do you like to shop for seafood? I tried Catalina Offshore but returned to Point Loma Seafood – their new shop/market is open. Love your recipe – saving for a special occasion at our house. Such a grab bag…there is no one set place. Whatever looks good but usually just at…Ralph’s. People tend to love their sweets it seems! Although Chipotle isn’t “gourmet”, we love to recreate our own bowls at home! This looks delicious, I love sea bass. Some days non-gourmet (okay most days!) is the calling card! So beautiful!! I love this! 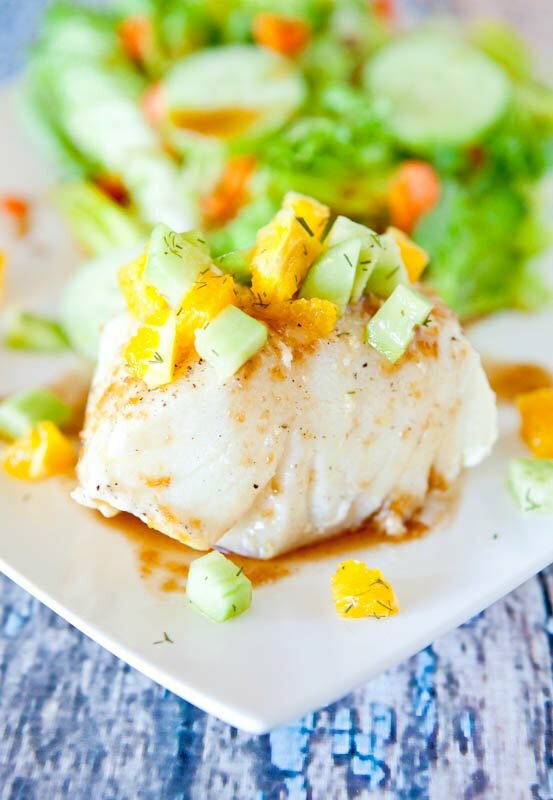 I’ve never had chilean sea bass, but this sounds incredible!! Averie, look at you with this stunning + elegant sea bass!!! I have been to the Bellagio ~ but never to MM’s restaurant. Now I need to go. 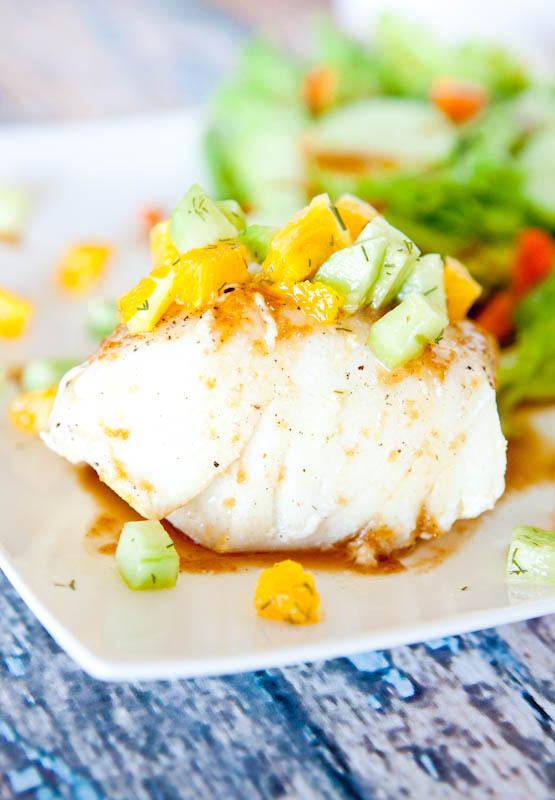 Or I need to make this sea bass. We need to go to the Bellagio together. Seriously, MM is probably my fave restaurant, of all time, ever. Across the globe, worldwide. I am super picky and even held to a ridiculous standard, they are…amazing. Delicious and decadent is good-especially if you’re celebrating an anniversary…in which case happy day! 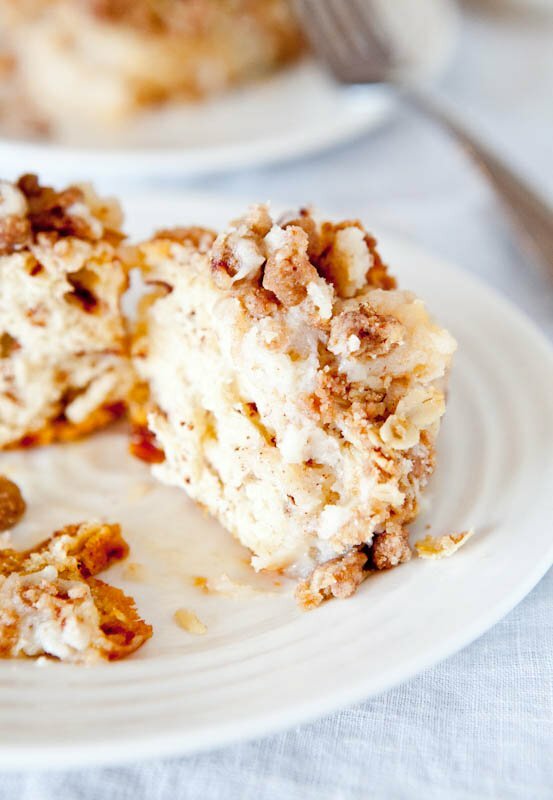 Also- hadn’t seen the cinnamon bun pie recipe before…gahhhhhh! I have to agree with the other comments I’ve seen. I may not eat fish, but your pictures are beautiful! This looks so appealing! I have some of Trader Joe’s orange muscat champagne vinegar which would be perfect for this. 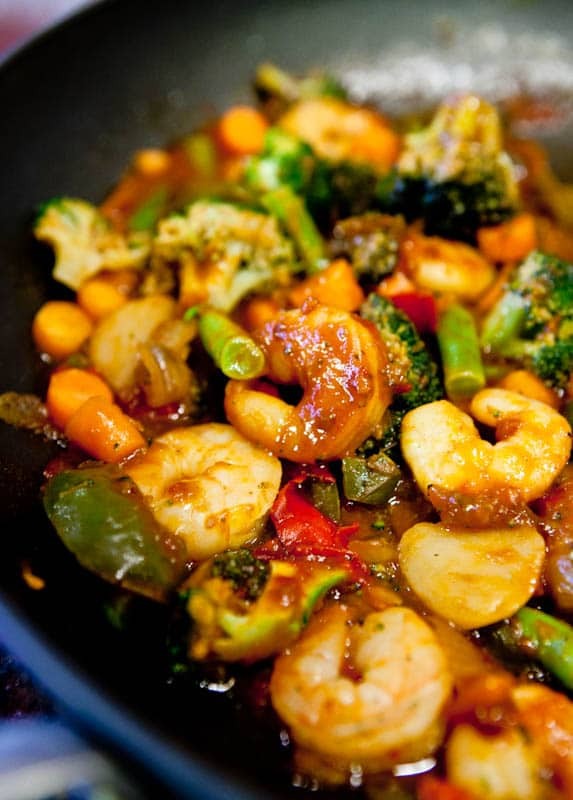 Have you ever cooked Swai before? I haven’t, but have 2 fillets in my freezer waiting to find a good way to prepare them. Perhaps this will be it. Thanks for sharing! Glad you like it and no I haven’t cooked Swai. Ive never bought that vinegar; will keep an eye out. Great combination of flavors in your recipe! 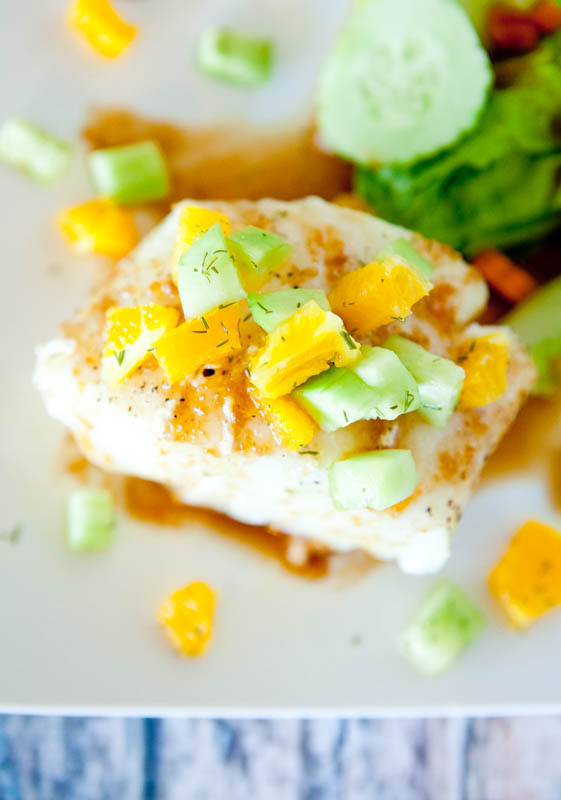 And combined with chilean sea bass… wonderful! Averie, this looks good and perfect in every single way. Wow. Beyond impressed. Thanks for the pin, too! LOVE the colours in this post. That fish looks so pretty! thanks, Jolene, and I think you’d like it! Thanks for sharing this recipe. 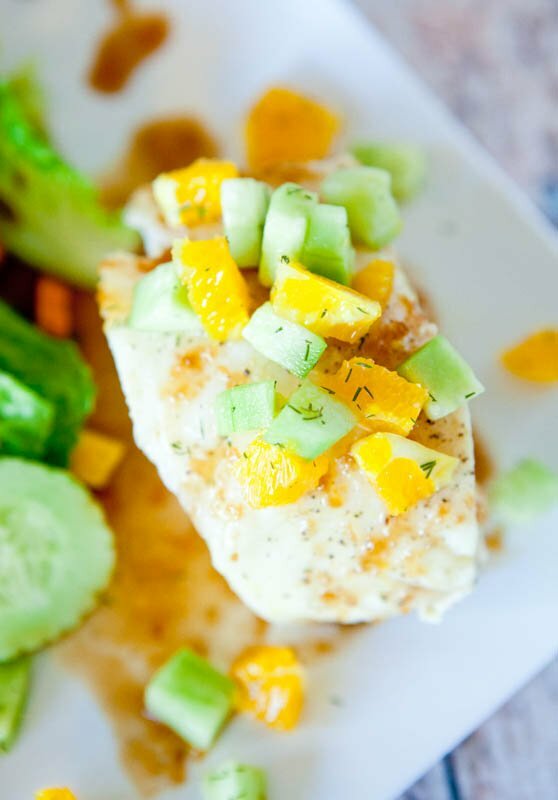 My sea bass was almost siilky in texture and the bright flavors of the orange and cuke were perfect. The bonus is that it is also quick and easy. I just wish the darn sea bass wasn’t so expensive, but it was sure worth it. This is definitely a keeper! I’m so glad you liked it! 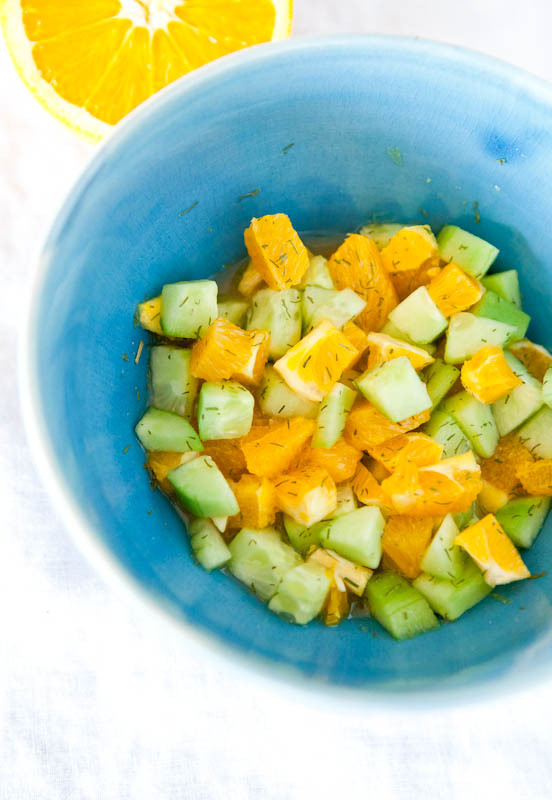 I love the flavors of orange + cuke…so good, even just as a little quickie summer side salad. I know, sea bass is very pricey – definitely a treat. 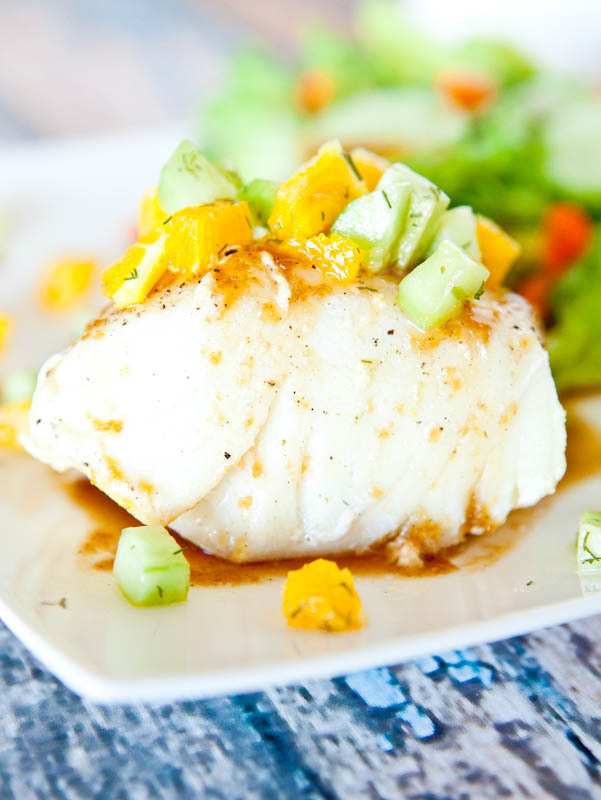 You could try this with tilapia which is about 1/10th the price!